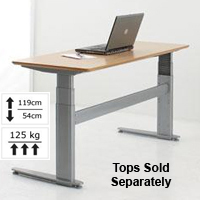 Height-adjustable workstations offer a convenient sit/stand solution for those who have difficulty sitting for prolonged periods. The entire workstation can raise or lower, so all of the materials and tools on your desk (such as source documents, computer and telephone) are always at the correct height. 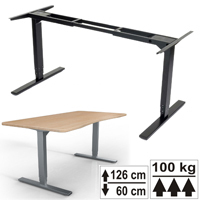 These desks are also referred to as stand up desks, standing desks or sit stand desks. Electric: the entire workstation can raise or lower at the touch of a button. Manual: the entire workstation can raise and lower by turning a hand-operated crank. These desks are sold unassembled, and will require assembly when they arrive. The tops are sold separately. Some people chose to order a base only and supply their own tops. This reduces shipping costs as tops are expensive to ship. Some people find that a monitor arm helps to better position the monitor for a good standing posture. Also, some of these models can be used in conjunction with a walking treadmill (ensure you have adequate width to accommodate both the treadmill and a chair). Ergo Vancouver maintains limited stock of these workstations. The section "What's in stock" will indicate the quantity on hand, if any. Where there is no stock on hand, orders are drop shipped to your address. Shipping costs will be added to all orders. For a drop ship the cost of shipping depends on a number of factors, but costs average ~$75 for a single base and ~$200 for a single base with tabletop. When stock is maintained locally, shipping will be less than for a drop ship. Orders for more than one unit will reduce the per unit shipping. Ergo Vancouver believes in environmentally friendly practices and encourages customers to re-use their current desktop or other locally manufactured desktops. Bases and tabletops are sold separately. All workstations are sold unassembled. Bases are available in two-legged, three-legged and one-legged (single column) models. This page lists some of the more popular models. Tops come in rectangular format and with beech finish. Other finishes (maple or black) may be available depending on the model. These finishes would be special order. If you would like an estimate please e-mail Ergo Vancouver. Please provide answers to the following questions:. How many legs sould the base have (1, 2 or 3)? Do you require a table top? What dimensions of table top do you require? To calculate shipping costs we require a shipping address. For businesses, we need to know if your location has a loading dock. Click here for the ErgoVerse Andromeda Electric Workstation Base and Diadem Tabletop. 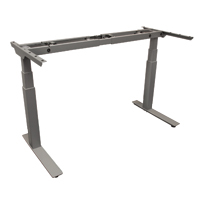 Click here for the Conset Electrically Height-Adjustable Workstations. Click here for the KV Waterloo Allegretto Height Adjustable Table Base.